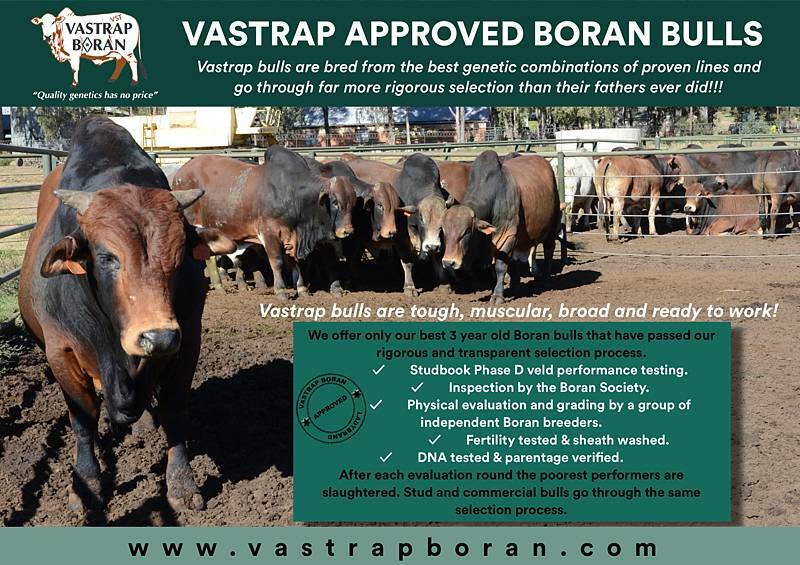 Over the past six years, Vastrap Bulls have made up more than 40% of all Boran bulls phase-D performance tested by Studbook. We pride ourselves in delivering hard muscular bulls that are broad in the chest, have strong straight backs and are highly adaptable. 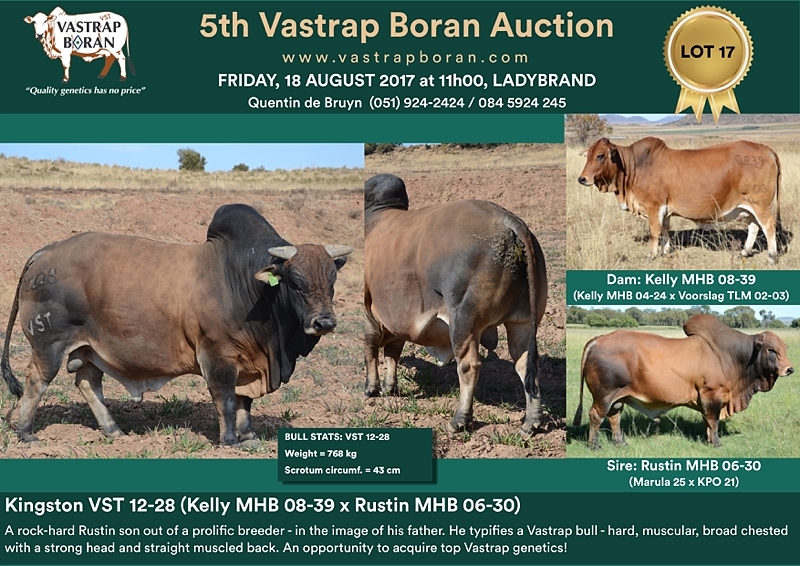 Every year we sell only 20 of our best, performance tested 3 year old bulls at the Vastrap Auction (see 2018 Vastrap Boran Auction and 2018 Vastrap Auction: Bulls on Offer). 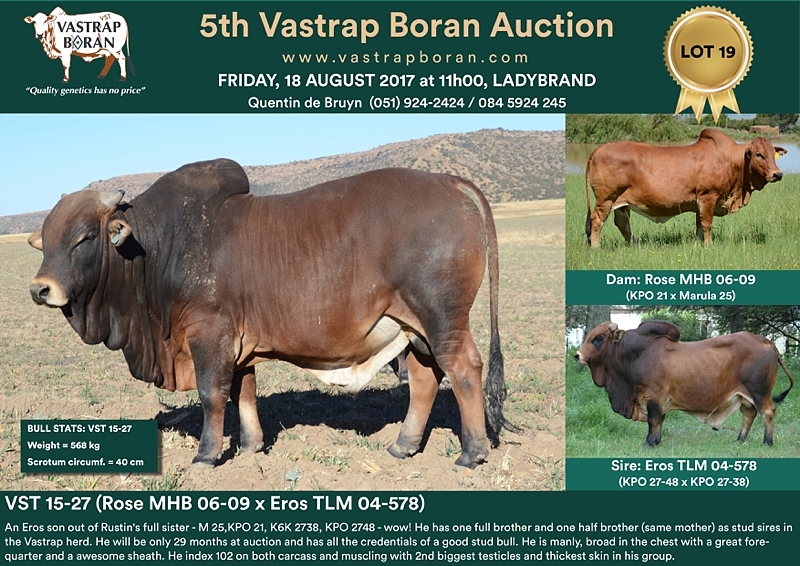 The average price of bulls sold at the 2017 Vastrap Auction was R43’000 and R39,000 in 2016. We are proud that our bulls have been sold to some of the top Boran breeders in Southern Africa (Bos Blanco, Chantemar, Bosiu Borane, Brenaissance, Faurzyl, Model Borane, Frontier Boran, B Hurwitz Farming, Biewenga Boran amongst others). 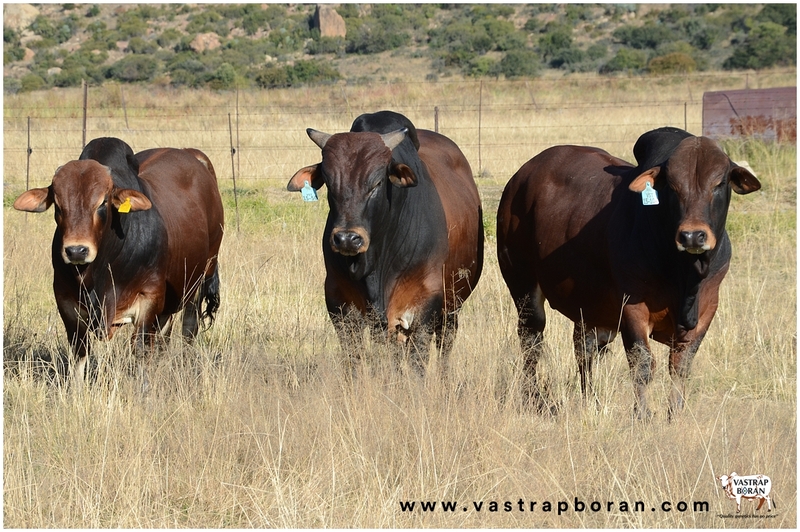 Vastrap bulls are also popular with less well known breeders and emerging farmers who are looking for good quality animals to beef up their herds. We truly have something for everyone and the same selection process applies to all our bulls, whether for stud or commercial use. Our bulls go through a three-step process of evaluation in an effort to offer only the best quality. First, Studbook performance testing on veld conditions. Second, inspection by the Boran society to eliminate those with structural faults. And lastly, a more detailed inspection and grading by a group of fellow Boran breeders. After each evaluation round the poorest performers are slaughtered. By doing this we endeavour to provide bulls that will be good ambassadors for both Vastrap Boran and the Boran breed as a whole (see Bull Selection & Performance Testing). All our bulls are also DNA tested and parentage verified (see The importance of parentage verification through DNA testing). Our policy at Vastrap Boran is to collect as accurate data as possible on every single animal, including birth weight, wean weight and the mother’s weight at weaning. We also collect 12 month and 18 month weights. In addition, since 2011 Vastrap has put 95% of its bull calves through the Studbook administered phase-D veld performance test, which provides additional important information such as testes development, muscling, meat yield and marbling to name a few. Vastrap alone has contributed over 35% of all the recorded phase-D bulls tested in the Boran stud industry (see The importance of accurate EBVs in animal selection). Please contact us for further information or visit us on the farm to pick the right bull for your herd! 2017 Vastrap Auction: Kingston VST 12-28 sold for R60’000 to Ockert Werner Model Borane. 2017 Vastrap Auction: VST 14-34 sold for R50’000 to Ockert Werner Model Borane. 2017 Vastrap Auction: VST 14-49 sold for R48’000 to Dr Ben Spies. 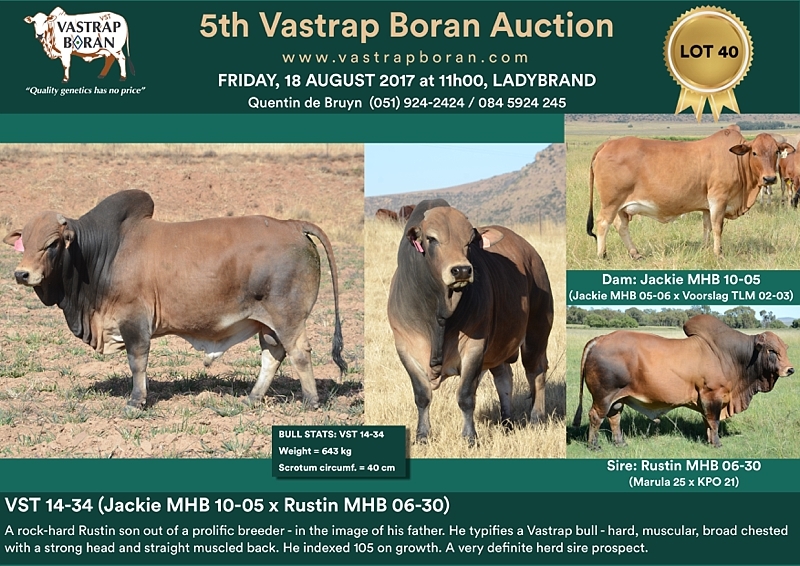 2017 Vastrap Auction: VST 15-27 sold for R45’000 to B Hurwitz farming. JULLE BORAN BEESTE IS BAIE MOOI !!!!!!!!! Thank you for your enquiry about our bulls. We only sell our bulls at 3 years of age. 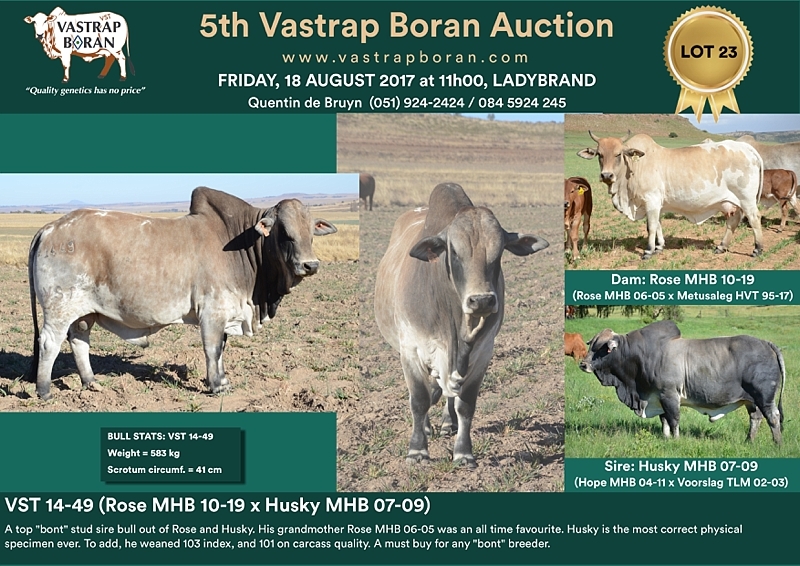 Our top 3 year old bulls will be on offer at the Vastrap Auction on 19 August and others that we decide are good enough to keep will be for sale off the farm. Where are you based? It is best to visit us to chose the right bull to suit your needs. Dis die mooiste bulle wat ek nog ooit gesien het. Baie dankie Marthin! Is waardeer dit baie. Hi Peter, thanks for your enquiry. VST 14-26 will be 3 years old in February. He definitely stands out relative to his peers and that’s why he is already for sale. Hi Mike, thanks for getting in touch with us. We will send you an email with details. Hi Tutuya, thank you for your message. We only sell Boran bulls at 3 years of age. You should be able to find good Boran in Kenya. Try Ol Pejeta. Im Gino.Um Base in Botswana is that possible for u guys to buy from you.another thing i want to know if you do sell heifer’s. Hi, baie dankie vir die navraag. Ons het nie op die oomblik bulle om te verkoop nie, want ons verkoop elke jaar op ons veiling ons 3 jarige Boran bulle. Ons veiling is Vrydag, 17 Augustus op die plaas. Ons sal vir jou ‘n epos stuur met meer informasie.